The humble porker has come in for a lot of stick this week from a government and its medics who claim that eating pig in all its forms is bad for your health. After watching Greg Kotis’ black comedy Pig Farm you’ve got to think they have a point. While the UK goes organic free range and every pig has a name and a pedigree, in the US they are farmed on a mind-boggling industrial scale. So, without sounding sanctimonious, this is a play wallowing in Yankee pigs**t….though it may be drifting our way across the Atlantic. 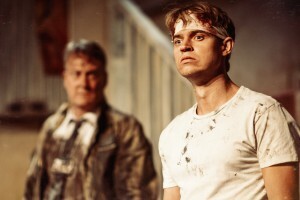 Pig Farm, which opened last night at St James Theatre, follows Kotis’ other hit at the venue, Urinetown. I’m not sure why he has a hang-up about bodily functions other than Freud would probably say that it’s all a huge metaphor for his fears about how civilization is going down the pan. I’d be telling porkies if I said this was a laugh-out-loud comedy. It starts on a low heat and builds up to the sort of gross out finale that wouldn’t be out of place in a David Lynch (or Cronenberg) slasher movie. Director Katherine Farmer brings home the bacon with a final act that is both outrageous and hysterically funny, sired from the sort of comic-book violence that owes a lot to Punch-and-Judy. And what’s it all about? Well, any guesses from the title? We’re down on the farm, some sort of redneck affair in the middle of America where everyone is probably related, talks real slow, wears plaid shirts and baseball caps and doesn’t mind spending their days covered in the proverbial brown stuff. It’s a cheap shot but Kotis gets a lot of mileage out of giving every character in this parody a name beginning with T. Who knows why? It’s puerile but you find yourself giggling at the alliteration every time. This four-hander sees Tom, his wife, a blonde tease called Tina, and their teen tearaway workie Tim, down on the farm amid 15,000 pigs (or thereabouts). Tom sneaks out in the dead of night to dump their slurry in the local river (catching a naked, frolicking, young couple in the murky outflow) while Tim takes a marker pen to try and count every pot-bellied porker on the property. It seems that, just as we have cod quotas, the Americans have pig counts – a once-a-year census when the government checks to see if the number of squealers you’re farming matches the number you’ve declared. 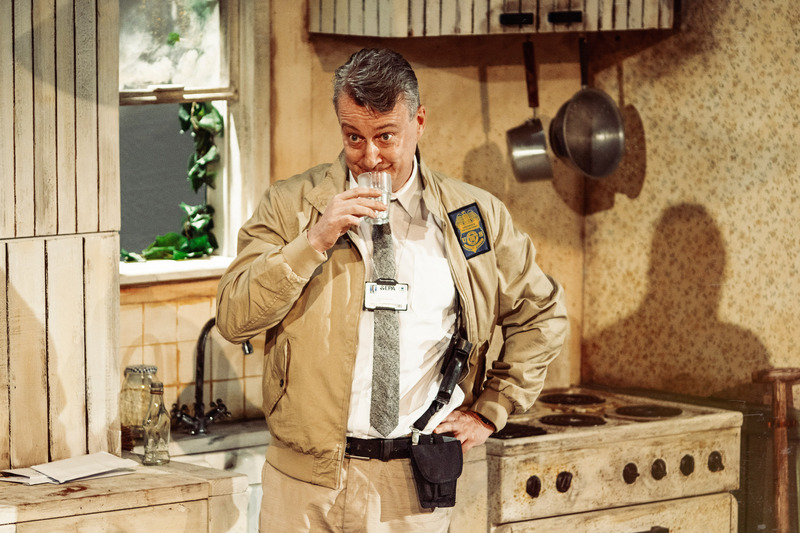 I’m not sure why it matters but the whole play revolves around the rather thin plot of the G-Man’s attempts to tally up the numbers – though it helps when the G-Man in question is played with impeccable timing by Stephen Tompkinson. We’re so used to seeing him glower and appear sullen in any number of recent TV series that it’s easy to forget just what a superb comic actor this Drop The Dead Donkey star is. An overlong look, the eyes fixed on another, a knowing smirk. It doesn’t take much but his appearance in the grubby farmhouse kitchen, late in the first act, instantly lifts the story which, until then, involved Topsy and Tim, sorry, the rather bestial Tina and Tim (or Tom) sullenly sniping at each other. Dan Fredenburgh’s Tom, the swine, does what a man has to do to make a living farming a ridiculous number of pigs, at the expense of giving his wife what she wants. Charlotte Parry, as the demanding Tina, in turn, satisfies the lust of the lecherous Tim (Erik Odom) while fending off Tompkinson’s tenacious Teddy. Babe it ain’t. But it’s barmy, bizarre and beautifully played (with not a hammy performance from anyone). Pig Farm plays at St James Theatre until November 21. Stephen Tompkinson is up to his eyes in the brown stuff when his attempts to take a tally of porkers goes totally to pot. Pig Farm delivers the bacon at St James Theatre.